I'm so excited about today's post because it's something we've been working on for a while. I wanted to get these kits out months ago as a fun summer project but somehow here we are in September (the month before our Christmas range is launched!!) and they're still not out...So I'm just going with it. 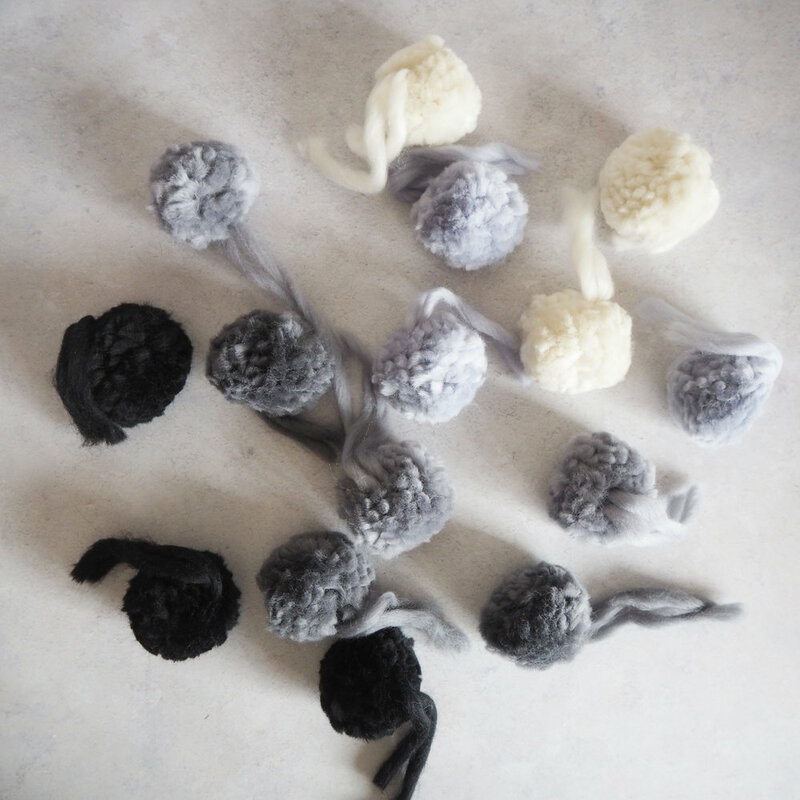 Today's post is an introduction to the brand-new pompom kits. They are beautifully packaged, pockets of joy that you can use in so many ways and make them your own. Available in three colour ways - fabulous 'Brights', dreamy 'Blooms' and moody 'Ombres' - you get a selection of 5 colours in each kit determined by which set you choose, and you can either mix them together to make multicoloured pompoms or stick to your five solid shades...or a bit of both. As well as the yarn, pompom maker and instructions, the kit also includes a tapestry needle so you can turn them into a garland or sew them onto your other knit kit projects. With one kit you can make up to 13 pompoms (each around 4.5cm) and with this many pompoms the opportunities are endless! I've created a lovely pinterest board full of pompom inspiration but the widget doesn't want to work so click the button below to have a gander! Hang them from a twig to make a wall hanging or mobile. Add them to clips to attach to your shoes! Mix them up with other textures and colours to create a visual feast! ...Look around you and see what you could mix them with. If I was going to give someone 'crafty' a gift right now I would personally opt for both a scarf kit and a pompom kit. With this they can knit a scarf then add pompoms to the ends, plus make a matching keyring, adorn their shoes/bags etc with pompoms and then make a little hanging decoration for a door-handle or curtain pole...It's a gift that would just keep on giving! I really really hope you like the and find them as fun as I do. I know from experience with the offcuts that so many of you are INSANELY creative so I absolutely cannot wait to see what you do with these.